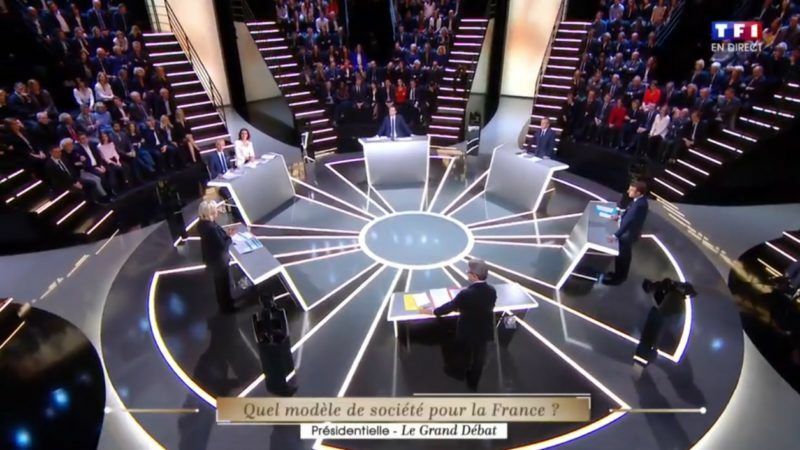 The five candidates for France’s top job set out their stalls in a three hour televised debate on TF1 on Monday night (20 March). Questions on Europe and foreign policy were only raised in the last quarter of an hour. EURACTIV France reports. The top five candidates for the 23 April election – Benoît Hamon, François Fillon, Emmanuel Macron, Jean-Luc Mélenchon and Marine Le Pen – came face to face for the first time in the campaign on Monday night. Candidates standing for smaller parties complained at being left out. In the absence of a strong guiding hand from the journalists, the candidates were free to set out their electoral programmes. After giving a rapid description of their aims as president, they discussed the subjects – chosen by TF1 – of education, security, immigration and secularism; comfortable terrain for the right-wing. In a debate that started at 9PM and lasted three hours, the question of the economy only came up after 10.30PM. Worse still, the subject of foreign policy was pushed to the very end of the programme. The man focus of the debate was on rather vague moral questions, to which the answers were hardly surprising: Le Pen called for tougher criminal sentences and more prison cells, while Fillon played the fear card by citing all the recent terrorist attacks. The debate became more animated on the subject of secularity, with Le Pen’s attacks on communitarianism and Islam provoking strong reactions from Hamon, Mélenchon and Macron, who decried her divisive view of society and stigmatisation of France’s four million Muslims. But the far-right candidate’s comments on the “uninterrupted flow” of immigration went unanswered. A surprising assertion, given that France has taken in far fewer than the 30,000 refugees it promised to host under the EU’s relocation scheme. In the same period, Germany has taken in more than a million refugees. On economic policy the candidates stuck firmly to their own ideas, and exchange was minimal. Macron proposed a gradual increase in the flexibility of the 35 hour working week, while Fillon said he would follow the United Kingdom and abolish the legal limit to working hours. Le Pen focussed her criticism on job-destroying ultra-liberalism and developed her concept of economic patriotism, which, itself, would rely heavily on self-employed workers. She also accused Europe of “preventing the use of French on French building sites”. Once again, this comment went unanswered, despite the fact that the EU has yet to comment on the Molière clause. Employment Commissioner Marianne Thyssen has said the clause may constitute discrimination that contravenes European law. After more than two hours, the debate finally turned to Europe, with Fillon attacking Le Pen over her plans to leave the euro. He argued that this decision would endanger all her economic measures. “We will not leave the European currency, we will not leave the ECB, which would mean ruin for savers and holders of debt.” This view was shared by Macron, who went further, saying that the Brexit campaign had now been discredited. On energy, Hamon argued for an end to France’s reliance on nuclear power and Fillon said the country should aim to meet its COP21 commitments with a CO2 price of €30 per tonne. Macron also insisted the country needed to gradually reduce the share of nuclear in its energy mix. A few minutes before the end of the debate, at 11.42PM, the candidates finally moved on to the world beyond France’s borders, discussing defence. “It is pure hypothesis to think that Europe will extend its nuclear umbrella over 28 states,” said Mélenchon. He added that the question of re-drawing borders was a valid one and that he saw certain similarities between Crimea and Russia. “We have also altered borders ourselves,” said Fillon, referring to Kosovo. “We should take into account the right of the people to decide for themselves,” he added, indicating he would not oppose Russia’s annexation of Crimea. Le Pen, who has close ties with Russia, shares a similar opinion, although she did not air it on Monday night. “We have hardly talked about Europe,” Macron lamented, five minutes before the end of the debate. “We have talked a lot about gifts, and it is easier to make gifts than to keep promises,” he said. The frontrunner then added that as president, he would guarantee France’s independence within the European Union. The other big issues noticeably absent from the debate were the scandals surrounding Fillon and Le Pen’s use of public funds, which had so far more or less monopolised discussions on the presidential campaign. But neither the journalists nor the candidates themselves raised the question.